Cheaper than Starbucks, Seattle’s Best Coffee is becoming really popular. The coffee tastes nice, it’s slightly better than its grocery store competitors, but keeps a good price. The company offers several different blends and packages: ground, whole bean, and k-cup coffee. What’s unique about this brand is its level system that makes it super easy to choose the right coffee. They have just released new packages as well (you can see the level number just beneath the name on the package). Seattle’s Best Breakfast Blend: Crisp and bright, with few citrus notes. Mild flavor and light body, it’s a nice choice for your morning cup of joe. The coffee is a bit acidic and crisp and will wake you up, but if you like your coffee strong and bold, levels 4 and 5 would be a better choice. Breakfast blend is a good choice if you like light, citrus coffees that are not very strong or bitter. 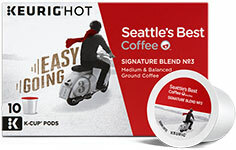 Seattle’s Best House Blend: Smooth and balanced. The House Blend has a mild taste and subtle flavor notes. It is less acidic than Breakfast blend and has no bitterness. Easy to drink, it’s a nice choice if you like to sip your coffee during the day. Nice, mild blend. I do think that Level 3 has a slightly better taste. Seattle’s Best Level 3 (now Portside Blend): Nice medium roast. Balanced and smooth. It’s similar to their House blend but has a bit more flavor. Well balanced. Seattle’s Best Level 4 (now 6th Avenue Bistro): I love dark roasts and that’s why I love levels 4 and 5. The level 4 is strong, rich, yet balanced and smooth. It has nice toasty notes, a hint of brown sugar and chocolate. The flavor is deep and toasty but not too bitter or overroasted. It’s one of their best selling blends. There is also an organic 6th Avenue Bistro Blend option. Seattle’s Best Level 5 (now Post Alley): Their strongest blend. Rich and intense. This coffee is good, bold and has a complex taste. No acidity with strong dark chocolate & nutty notes. Perfect for dark roast coffee fans. Level 5 is also a great choice for iced coffees and milky drinks. 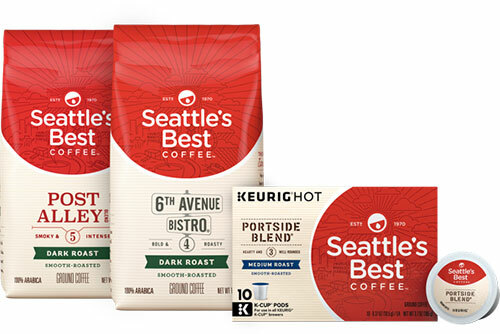 Besides whole bean and ground coffee, there are also Seattle’s Best Coffee k-cups. There are 5 different k-cup options: Breakfast Blend, House Blend, Portside Blend (level 3) and flavored Vanilla and Hazelnut k-cups. They don’t make level 4 and level 5 k-cups. Not every blend and every package are in every area. You can use product locator to see which option is available in your area. You can also find them on Amazon. Love the breakfast blend. My favorite. Better than going out and buying coffee at dunkins or starbucks! Just checked on Amazon, and SB is making 4 and 5 (6th Ave and Post Ave)in Keurig cups. About $48 for 60 KCups. Didn’t want to hear that the taste and acidity has changed to weak and bitter on these, though. Just ordered a case of each! We’ll wait and see what brews up…. I’ve used and loved SB coffee (level 4) for years and agree Seattle’s Best changed the strength and flavor. Recently, I’ve had to double the amount and it’s still weak and tasteless. most bitter coffee.could not drink post alley #5. 1st. & last time buyer.called seattle# on box and got starbucks.evidently same company. Number 5 was the coffee my family ALWAYS drank. They have changed the name and also the flavor. I could not be more disappointed. In search of another. Please return to the same flavor, don’t care what you call it. I agree- We loved the Number 5. But since they changed the name, they’ve also changed the flavor- from strong and well-rounded to weak and extremely bitter. It’s terrible! After years of drinking number 5, we now have to find a new coffee to drink at home. Love the red coffee cup with the dog. How can I get one of those. And oh yes we love the coffee. My favorite is number 4. I like them all. Number 5 is really good if you like dark roast. I have never been there, but each time my friends travel, they bring me some authentic coffee beans. So, two years ago I got few packs of original Havaiian coffee beans from my best girlfriend and her husband, Kona, Ka’u and Maui beans, as I can remember.There all were exceptional, but Ka’u is my top choice! I would pick Level 2 myself. The only time I drink coffee is when I visit my girlfriend down south because that is what she loves to drink the most. I have heard coffee tastes really great and it reminds me of Seattle. Starbucks coffee isn’t half bad either. Have you ever tried coffee from Hawaii?